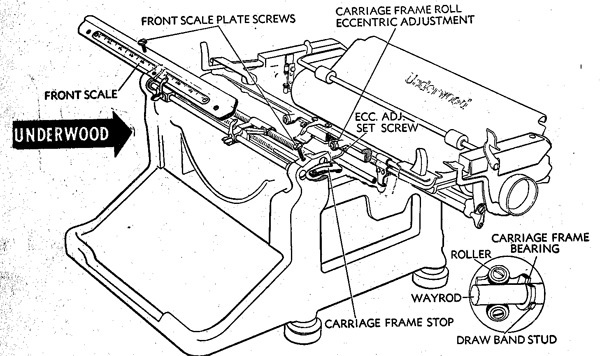 Typewriter Talk » 1939/1940 Underwood Part Identification - What is this part? » 1939/1940 Underwood Part Identification - What is this part? 1939/1940 Underwood Part Identification - What is this part? As I had turned my 1939 Underwood Master typewriter over, this part fell out (see link above). I know it's part of the carriage. However, I do not know any specifics on location and where it should go? Re: 1939/1940 Underwood Part Identification - What is this part? It's about 3/4 of an inch long. Looks like the end opposite the hole has broken off? Yes it is definitely the carriage frame stop. It should be secured by a long screw (which also holds the plate on that has the scale on it, just as shown in the illustration). Thanks, great diagram. Where would I find that type of diagram for this typewriter? It may be a different model than yours (I can't remember which Underwood was covered in that manual), but should share many of the mechanics.